The company offers VSAT broadband access to the Internet in areas with poor telecommunications infrastructure. The main medium of transmission is a broadband two-way satellite transfer system which provides good access to the internet in even the least accessible areas. TS2 SPACE offers all possibilities of using communications satellites to send data and voice. The company allows you to make a phone call from anywhere in the world, together with the appropriate data encryption. It also enables global access to the Internet and a range of services related to sending and receiving large amounts of data. Satellite communication offered by TS2 SPACE is particularly useful in conditions where traditional communication is difficult or impossible, for example due to a lack of adequate infrastructure on the ground. This has particular significance for defense needs. In cases of participation in armed conflicts and peacekeeping missions, having encrypted communications and data transmission systems is a necessity. At the same time they should operate independently of local telecommunications infrastructure. 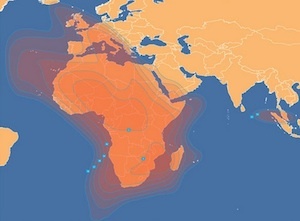 AFRICASAT has been providing satellite capacity for Africa since 2008. The advanced AFRICASAT-1a satellite at 46.0°E provides high powered state of the art satellite capacity across the African continent, with connectivity to Europe, the Middle East and South East Asia. Leveraging facilities at MEASAT Teleport and Broadcast Centre, and through partnerships with a select group of world class partners, AFRICASAT is able to provide a complete range of satellite solutions including VSAT services, disaster recovery, co-location, uplinking, broadband, IP termination services and HD/SD video playout solutions.